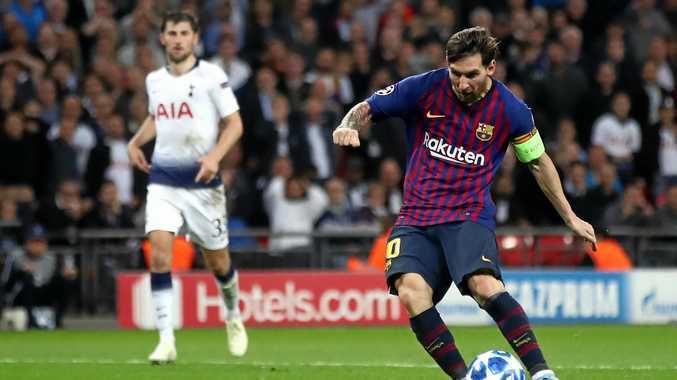 LIONEL Messi scored twice as Barcelona beat Tottenham 4-2 at Wembley to leave the London club's Champions League qualification hopes in tatters. Spurs lost their first match to Inter Milan 2-1 and Mauricio Pochettino's men are now pointless in Group B, six points behind Barcelona and Inter Milan who beat PSV Eindhoven 2-1. In Napoli, Lorenzo Insigne's last-gasp effort helped Napoli beat Liverpool 1-0 at Stadio San Paolo which sent the Serie A side to the top of Group C.
Carlo Ancelotti's outfit were the brighter throughout but only made their dominance pay in the 90th minute when Insigne tucked home Jose Callejon's low cross. Philippe Coutinho opened the scoring for Barca after just 92 seconds, firing into an unguarded net after Spurs keeper Hugo Lloris had rushed out. The France captain had no chance with Ivan Rakitic's superb 20-yard volley in the 28th minute, though, which flew in off the inside of the post. Messi twice hit the post in the early stages of the second half before Harry Kane pulled a goal back for Tottenham after 52 minutes with a curling effort from 15 yards. Messi restored the visitors' two-goal advantage with a delicate left-footed finish in the 56th minute and added his second late on, after Spurs had hit back through Erik Lamela's deflected effort. Pochettino praised his players for making Barcelona fight for their victory after the visitors' fast start. "I want to congratulate the team because we were always in the game. It was massive in the second half, we were fighting and never gave up," he told BT Sport. "He's (Messi) a fantastic player and not because I tell you but the most important is because Messi in every game shows why he's Messi." Earlier, Neymar had turned on the style as Paris St Germain got their campaign back on track with a 6-1 victory over Red Star Belgrade at Parc des Princes. The Brazil forward scored a hat-trick, two of them free-kicks, as the Ligue 1 champions bounced back from their 3-2 defeat at Liverpool in their opening Group C fixture. Edinson Cavani, Angel Di Maria and Kylian Mbappe also scored for Thomas Tuchel's side while the Serbian outfit, with Socceroo Milos Degenk in cenytral defence, grabbed a second-half consolation through Marko Marin. "Neymar was outstanding. He was just sensational, magnificent," PSG coach Thomas Tuchel said. "You can sense that he's hungry, that he wants to make the difference and win the ball back." Atletico Madrid and Borussia Dortmund both maintained their 100 per cent record in Group A with home victories against Club Brugge and Monaco respectively. Antoine Griezmann put Atletico ahead after 28 minutes before a stunning strike from Arnaut Danjuma brought Club Brugge level 11 minutes later. Griezmann's second of the night after 67 minutes restored Madrid's advantage before Koke rounded off a 3-1 win for Diego Simeone's side. At the Westfalenstadion, substitute Jacob Bruun Larsen, Paco Alcacer, who had earlier missed a penalty, and Marco Reus wrapped up Dortmund's comfortable 3-0 victory over Monaco. In Group D, Moussa Marega's second-half header earned Porto a 1-0 win at home to Galatasaray while Weston McKennie left it late to secure Schalke a 1-0 victory at Lokomotiv Moscow.